The Worcester Greenstar 42 CDi Classic combi has been designed for larger homes with two or more bathrooms and offers the largest output in the range of combis. 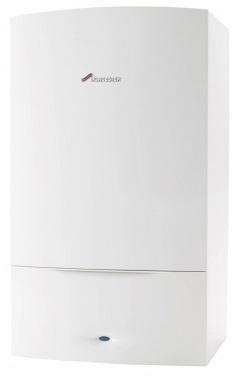 With a SEDBUK 2009 efficiency rating of 92% the 42 CDi Classic is a highly efficient combi boiler. The flow rate is typical for this size of boiler at 17 litres per minute and should meet the requirements of larger households. However your flow rate is also dependent on the mains pressure to your property, so be mindful of that. The Classic combi range all measure 76x44x36 cm and weigh in at 47.5kg which is typical for a boiler of this size. All Worcester Bosch boilers are recommended by the Energy Saving Trust as well, so it's good to have their backing. Worcester’s Greenstar CDi combi boilers are unique in that they condense in both heating and hot water modes, resulting in greater efficiency and fuel savings. With them, hot water and central heating temperatures can be controlled, with hot water instantly available. All of the Classic range of boilers are wall mounting and can be sited in numerous locations and have intelligent manual and digital controls. They are also environmentally friendly, don't forget. [x] Greenstar 29CDi - The central heating output for this boiler is 29kW so is still suitable for larger properties with more than one bathroom. Provided again, that adequate mains pressure is available it also has a domestic hot water flow rate of 12.3 litres per minute at 35 degree temperature rise. Efficiency is particularly good at 89.1 per cent. [x] Greenstar 34CD - Provides all the benefits expected of the range with a central heating output at 34kW. The domestic hot water flow rate is 14.3 litres per minute at 35 degree temperature rise (provided adequate mains pressure is available). Efficiency is at 89 per cent. [x] Greenstar 42CDi - and of course the 42CDi featured on this page has a central heating output of 42kW and a domestic hot water flow rate of 17.2 litres per minute at 35 degree temperature rise (provided adequate mains water pressure is available). The Greenstar 42CDi is 92 per cent efficient. Regardless of which kW output you decide to choose, the Classic Greenstar range of Combi boiler from Worcester will always be a good choice.